Merchant banker is an institution which carries out a range of services related with securities after obtaining license from concerned authorities. As defined in Section 2 (gha) of Merchant Banker Regulation 2064 (amended 2074), Merchant banker refers to the securities businessperson licensed to carry out one or more activities mentioned in Rule 16. The activities mentioned in Rule 16 are: activities related to securities issuance and issue management, underwriting, Registrar to shares, portfolio management and corporate advisory. Thus, merchant banker is an institution, licensed by Securities Board of Nepal (SEBON) to provide various types of services related to securities. Value Added Tax Act 2052 has stated in Section 5 that the supply, import and export of goods and services, other than the items enlisted in Schedule 1, are VAT attractive. As per Group 11 (II) of Schedule 1 of VAT Act, among others, “financial service” is exempt from VAT. The VAT Act has not defined the term ‘financial service’. Since there is no specific definition in the Act, as per the principles of interpretation of law, we have to look for the dictionary meaning of the term. As per Oxford English Dictionary, financial services refer to the professional services involving the investment, lending, and management of money and assets. The nature of transactions carried out by the merchant bankers is primarily oriented towards service. Merchant Bankers carry out various transactions including issue management of securities, underwriting, portfolio management and acting as registrar to shares. They also provide the services of fund management, depository and corporate advisory after obtaining license from SEBON. Similarly, they also provide the service of Depository Participant (DP) after obtaining license from SEBON and membership from CDS and Clearing Limited (CDSC). Thus, it is seen that the services provided by merchant bankers are financial services, and so, they are considered as VAT-exempt services. The merchant bankers have been assessing income tax at corporate rate of 25%. However, there is dispute regarding the tax rate among some scholars. Some scholars are of the view that merchant bankers should deposit tax @ 30%. Their argument is that it is not legally justified to enjoy double benefits by not getting registered in VAT (being financial service provider) as well as not paying tax @ 30% (not being a financial institution). As per Schedule 1 of VAT Act 2052, "financial service" is exempted from VAT. The VAT Act has not further defined the term financial service. Since the merchant bankers deal with fund placement and investment related activities, the transaction of merchant bankers are seen to be related to financial service. However, the merchant bankers have not considered themselves as financial institutions and hence depositing 25% tax. The scholars argue that the merchant bankers are neither registered in VAT, nor are they paying tax @ 30%, which is not legally justified. Another group of scholars do not seem to agree with this argument. Section 2 (1) of Schedule 1 of Income Tax Act 2058 has stated that the tax rate for entities shall be 25% subject to the sub-sections (2), (3), (4), (5) and (7). Sub-section (2) has mentioned the tax rate of 30%, among others, to the banks and to financial institutions. The merchant bankers are licensed from SEBON to carry out various merchant banking activities. They do not have to obtain permission or license from Nepal Rastra Bank (NRB) to carry out its transactions. They do not fall under the definition of banks or financial institutions under prevailing laws. Therefore, the scholars argue that they are not required to pay tax @ 30%. Although they are called "merchant bankers", they are not really banks or financial institutions are per the theme of Bank and Financial Institutions Act (BAFIA). The transactions carried by them are, of course, related to financial transactions. However, they cannot be considered as banks or financial institutions. Had they been banks or financial institutions, they would not have been able to carry out their business without obtaining permission or license from NRB. Merchant bankers carry out transactions by obtaining license from SEBON. Income tax Act has provided the rate of 30% to banks or financial institutions, rather than to the financial services. As per Restrictive Clause (3) in Section 1 (4) of Schedule 1 of Income Tax Act 2058, Tax @ 5% is levied on gain from disposal of securities listed in SEBON, in case of a natural person. Further, Section 95Ka (2) (Ka) of Income Tax Act 2058 has prescribed the rate as 5% for listed stocks and 10% for unlisted stocks. 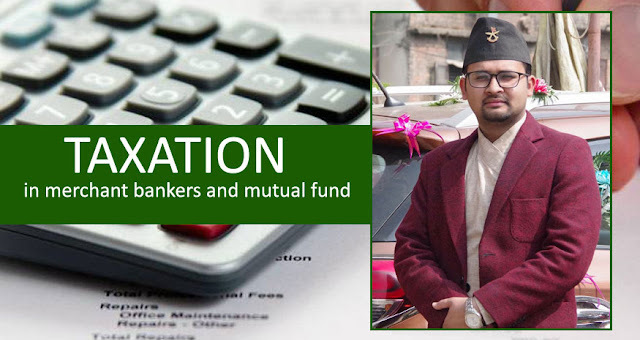 Hence, the capital gain tax on disposal of mutual fund units by the unit holder (natural person) is 5% as the mutual funds in Nepal are required to be listed. Such tax is deducted as advance tax. Since the rate prescribed by Schedule 1 is also 5%, no further tax has to be deposited by the person. As per Section 95Ka (2) (Kha) of Income Tax Act 2058, the rate for capital gain from disposal of listed stock is 10% and for unlisted stocks is 15%. In case of regular sale, the capital gain is calculated by the brokers on sales value less cost price. The net amount, if positive (i.e. gain), is taxed @ 5% for individuals, 10% for entities and no tax for mutual funds, as discussed earlier. For example, if a person has purchased 100 units @ Rs. 10 at Day 1, and if the NAV per unit is Rs. 16 at the maturity, then he shall be refunded with the redemption value of units held by him, i.e. Rs. 1,600. In such case, there may arise some capital gain. The treatment of capital gain is same as in normal sale. The capital gain is calculated on redemption value less cost price. The net amount, if positive (i.e. gain), is taxed @ 5% for individuals, 10% for entities and no tax for mutual funds as discussed earlier. Mr. A applied for 2000 units in ABC Mutual Fund Scheme at New Fund Offer (NFO), where he was allotted at full. He further purchased 3000 units from secondary market at Rs. 12.80 per unit. As on maturity date, his holding is 5000 units. The weighted average cost per unit comes to Rs. 11.68 (i.e. [2000 x 10 + 3000 x 12.80] / 5000). Suppose the redemption value of the scheme at the maturity comes to Rs. 16 per unit. Hence, the capital gain is Rs. 4.32 per unit, or Rs. 21,600 in total. Since Mr. A is a natural person, advance tax @ 5% is deducted on such capital gain. Can the unit holder apply for Section 46 of Income Tax Act 2058 in case of disposal by redemption of the fund? Is it an “involuntary” disposal? Section 46 has included the conditions stated in Section 40 (1) for qualifying conditions. Under Section 40 (1), disposal has been referred to the removal of ownership by various means including, among others, by distribution, by cancellation, or by the completion of any period. But the question is, whether the disposal of units by way of redemption is ”voluntary” for the unit holder? Would he not continue to hold the units if the Fund had continued instead of maturing? However, if we look at Section 88 carefully, there is provision regarding the distribution by mutual fund in sub-section (1) of Section 88. Similarly, there is also provision regarding the payment of dividend in sub-section (2) of the same section. Hence, it can be interpreted that the distribution by Mutual Fund is governed by Section 88 (1); and in case of payment of dividend by others, Section 88(2) is to be considered. Finance Ordinance 2070 has inserted the provisions for mutual fund is four different areas throughout the Act. However, it has not included the term "mutual fund" in any definition under Section 2. If the theme of the Ordinance was to denote mutual fund as "unit trust", it could have inserted the term mutual fund in its definition while inserting new provisions for mutual fund. However, the Act is silent about the definition of mutual fund. Looking at these facts and interpretations, the treatment of mutual fund as a company is not clearly justified. Hence, there is a reasonable doubt in deduction of 5% TDS on distributions by Mutual Fund. In practice, the Mutual Fund schemes have been deducting 5% TDS for natural persons and 15% TDS for entities (except Mutual Fund). The Fund managing company manages the Mutual Fund. The Mutual Funds have separate legal status from the Fund Manager. So, the Fund and fund manager are separate entities. Mutual Funds are not registered in tax and hence do not have a Permanent Account Number (PAN). But, they have to deduct TDS on payment of various types of services. Such TDS deducted by the Fund is deposited by the Fund Managing Company on behalf of the Fund. Question for the reader: The income of mutual funds constitutes dividend, capital gain and interest. Tax deduction in all of these headings is not required as per Section 88 and Section 95Ka of Income Tax Act 2058. However, Mutual Funds are neither included under the definition of exempt entity in the Income Tax Act 2058, nor are there any provisions of exemption in Section 10 or concession in Section 11 of the Act for Funds. Is the income of mutual fund really exempt from tax? Does “no withholding” refer to “no tax” for mutual funds? In India, the capital gains of mutual fund are not taxable. Similarly, the net income of the Fund is also not taxable. However, it has to pay Securities Transaction Tax (STT) on equity market related transactions. In case of debt-schemes, the Fund has to pay additional tax on income distribution (termed as Dividend Distribution Tax). The unit holders are provided with tax benefits compared to the provisions of Nepal. The unit holders have to pay Securities Transaction Tax (STT) on sale of units of the equity oriented Mutual Fund. No tax is charged on purchase of such units. Similarly, no tax is charged on sale of units of other than equity oriented Mutual Fund. The unit holders have to pay capital gain tax. In case of equity schemes, the long term gain (i.e. more than 1 year holding period) is not taxable. However, the gain on other schemes (whether short term or long term gain) is taxable. In case of long term capital gain of non equity schemes, inflation adjusted cost is taken as per the cost inflation index published by government in each fiscal year. The unit holders do not have to pay Dividend Distribution Tax (DDT) unlike in Nepal. So, the dividend received by unit holder is exempt from tax. However, in case of non equity funds, the fund has to pay DDT which reduces the NAV of scheme. This causes indirect cost for the unit holders of the scheme. In case of resident persons, no withholding is required; the receiver has to do self assessment of tax himself. However, in case of non-resident persons, the tax is withheld. A depository takes the ownership guarantee of the shareholders by holding those securities and other market instruments which are listed in the secondary market, distributed or allotted and can be deposited into the electronic form. A Depository Participant is an agent of the depository who has received the registration certificate from the Security Board of Nepal and the membership license from CDSC.